Please make trade orders through our distributor Combined Book Services. We will be delighted to take your orders for books, despatch them and invoice you. You can pay using Visa through PayPal (no PayPal account necessary), sterling cheque, or electronic transfer. The final price you pay includes postage and packaging of your order. We use recycled packaging as much as possible, so your order might arrive in cardboard that has been used before. All our packaging and tape is paper-based and recyclable. Plain and simple block colours. The card will be plain white or cream, and we’ll write your greeting in our best handwriting. Email us at enquiries @ handheldpress.co.uk (a) telling us that you’d like to order Book X to be sent to Person Y at Address Z, (b) tell us what kind of wrapping paper you’d like, and (c) give the greeting you’d like on the card (if any). We will reply very quickly confirming the order and giving you the total cost of purchase, plus p&p if needed (free to addresses in the UK). 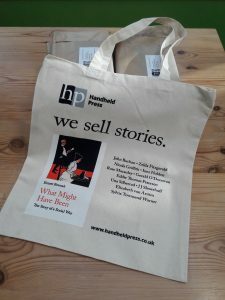 You send us the payment using www.paypal.com (no PayPal account required: it uses Visa) to enquiries @ handheldpress.co.uk). We also accept sterling cheques (payable to Handheld Press, posted to 72 Warminster Road, Bath BA2 6RU), and electronic transfer (we’ll send you the account details). We’ll send a confirmation email when the present has been posted, with a scanned receipt if needed. Your delivery will be posted on the working day after your order has been received, in most cases, when the order has been received before 13.00. If you need a guaranteed next day delivery then let us know by email or phone after you’ve made the order, and we can tell you the additional fee for this service, and how to pay. All orders will be posted from the UK using Royal Mail services. Orders received on weekends or on bank holidays will be sent the next working day. If we’re on holiday and unable to post orders until we get back, there will be a notice giving the affected dates on the home page. When you place an order, your payment will be processed through PayPal, which uses the highest level of encryption to ensure your details are kept safe. We aren’t yet able to accept credit or debit card payments: sorry! If a book is out of print with no republication date (unlikely, to be honest). Where PayPal have not been able to process your payment. We’ll post your books when the cheque has cleared, which will take up to 10 working days. All cheques should be made payable to Handheld Press. Books are not subject to VAT in the UK.